How do I download the latest version of the Zoom client? How do I create and manage breakouts in Zoom? How do I share a YouTube video in Zoom? How do I start a meeting in my Personal Meeting Room? How do I sign in as host for a meeting I scheduled? 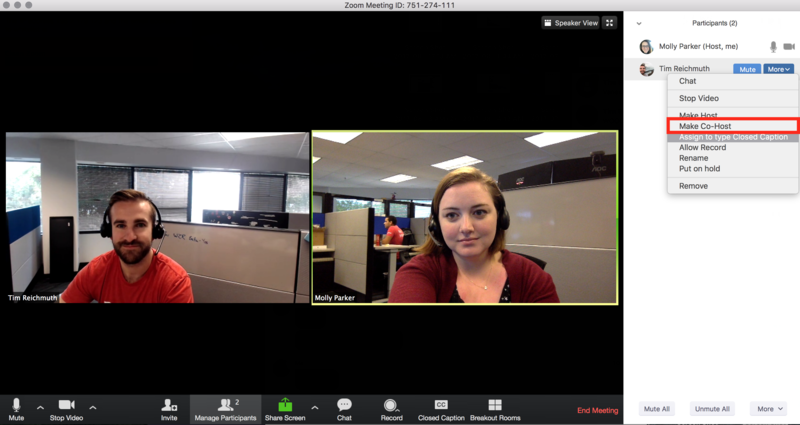 The Co-host feature allows you to share hosting privileges with another user in a meeting or webinar. This can be useful to allow another user to manage the administrative side of the meeting, such as muting participants or starting/stopping the recording. Instructors will often add their teaching associate or support person as the Co-host to help facilitate an online class meeting. Navigate to the Co-host option on the Meeting tab and verify that the setting is enabled. There are two ways that you can make a user a co-host. In the meeting, the host hovers over the user's video, clicks on the three dots and chooses Make Co-Host. Alternatively, the host can make another participant a co-host through the Participants window. 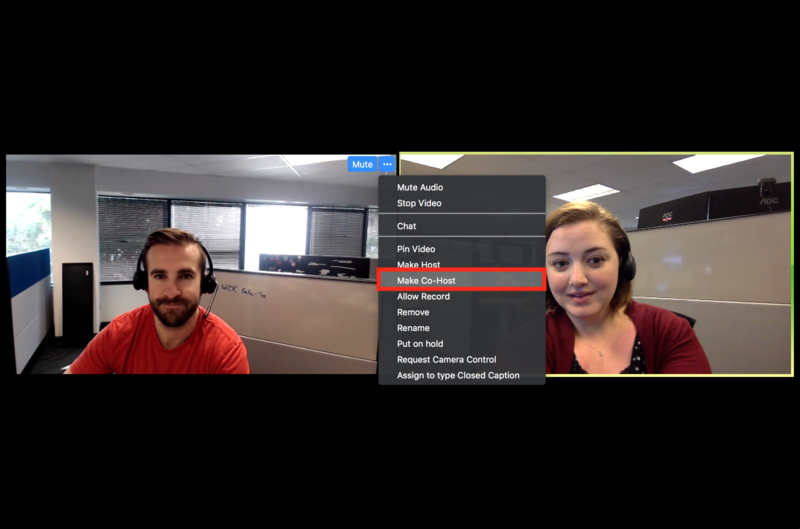 Click on Manage Participants in the meeting controls at the bottom of the Zoom window. Hover over the name of the participant who is going to be a co-host, and choose More. Start attendee on hold: place the participant on hold, removing them from the video and audio conference. Note that the Allow host to put attendee on hold option must be enabled prior to starting the meeting. See Attendee on Hold for details. Record: record to the cloud or locally to their computer, based on the host's settings. If they choose to record to the cloud, the recording will go to the host's Zoom account. Note: The Co-host will not be able to end the meeting or make another user the host. The Co-host is also unable to create polls or manage breakouts.